We attended the York County Fireman's Convention today. We rode down with the guys from Station 19. Had nice weather and a really great day! 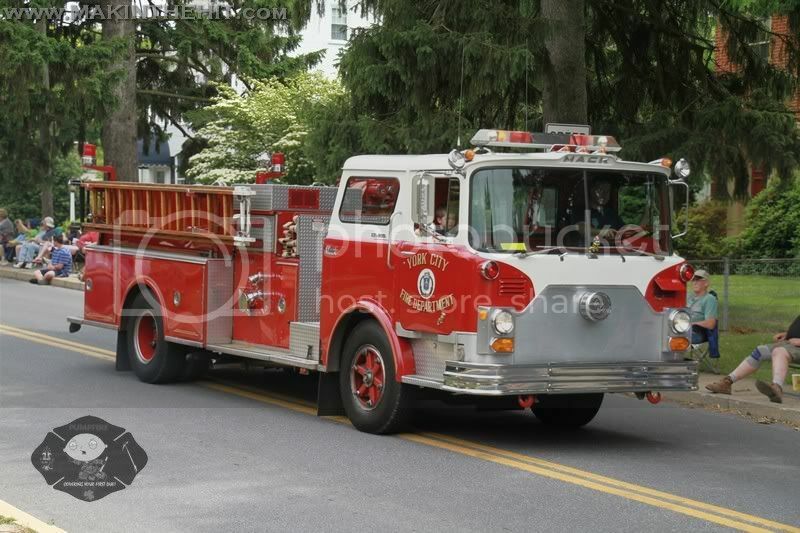 Once again this year we loaded up the Young's from Maryland and rode int he Stewartstown Parade. Although it rained half way through no one took me up on my offer of riding up front! What troopers! 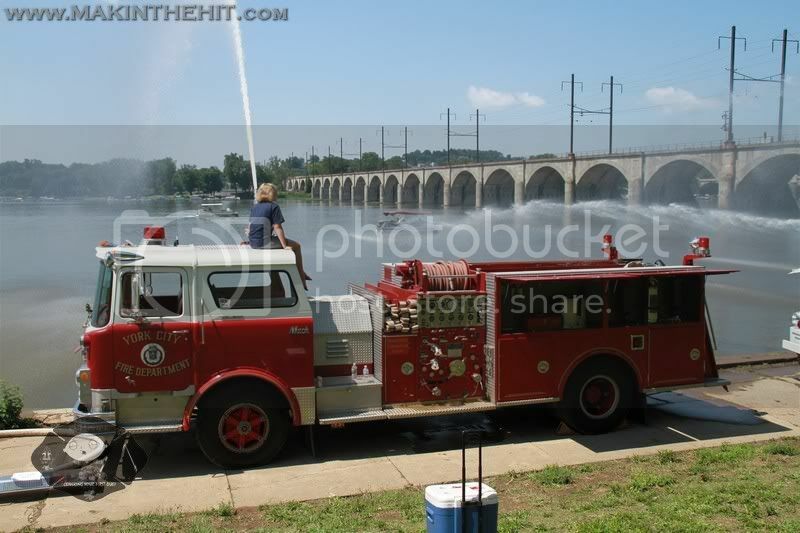 On Friday July 8th I took the day off to get the engine ready for the annual trip to Harrisburg's riverfront park for the PA Pump Primers Muster. I had bought a new light to replace the modern light bar. Owen and I got this on the truck in the morning. In addition, we purchased some diamond plate to cover up the rust on the corners of the jump seat. Late Friday evening we mounted the recently acquired deck gun on the roof. Bright and early Saturday morning we met the crew at the Yoe Fire Company for the ride up to the Farm Show complex. After the ride up to Harrisburg we parked and started cleaning up. After the Parade down to the waterfront we got everything setup and started pumping. 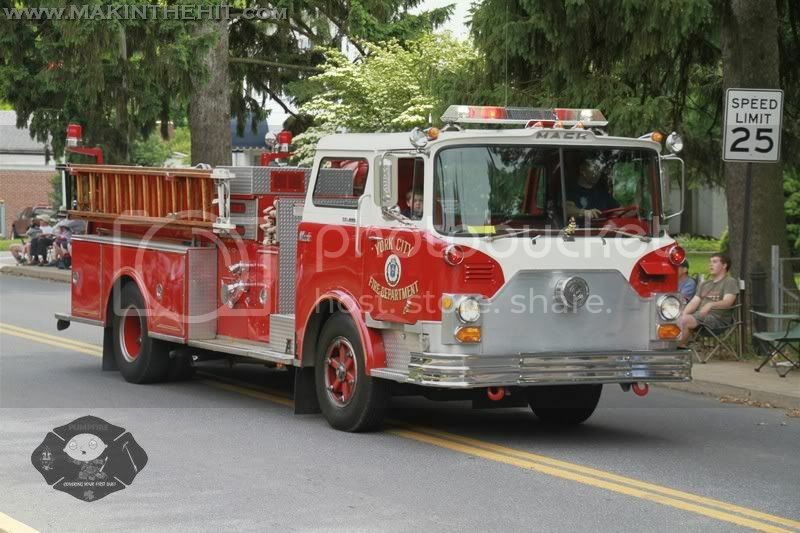 Here are a few You Tube Videos I found from this years parade. 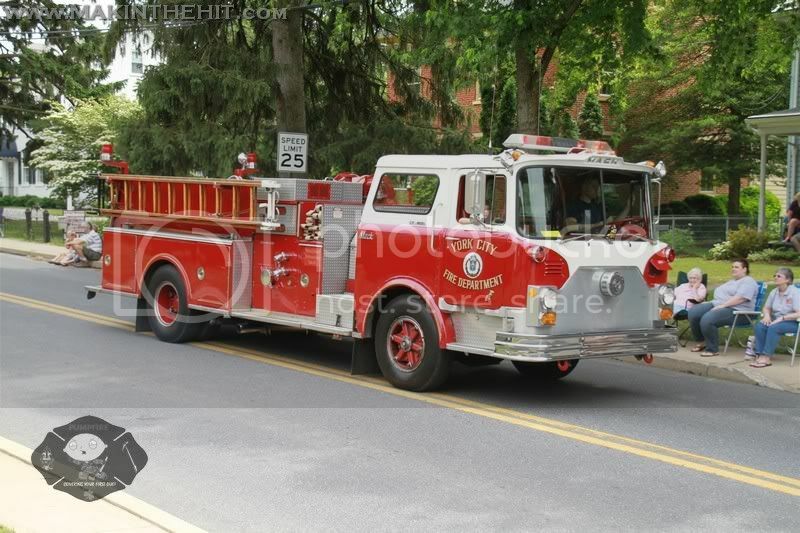 Well got the old girl out and shined up for the Lancaster County Fireman's Convention Parade in Millersville, PA. My Officer Owen and I had a great time. Between the Spring Thaw in Allentown, a friend of a friend who is selling stuff and a local fire comapny selling stuff quite a few purchases over the past month. 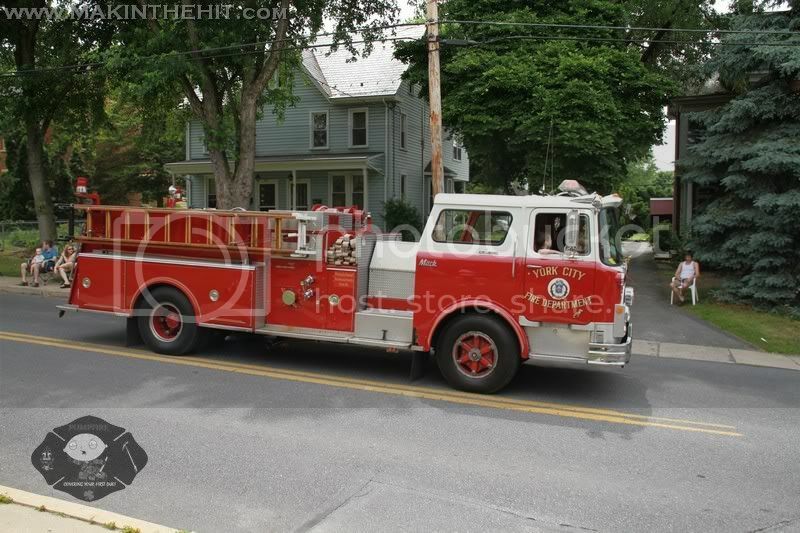 Now to get it all mounted and on the Engine before the first parade on June 4th! Went to an auction and acquired a picture from around 1975 of the engine. 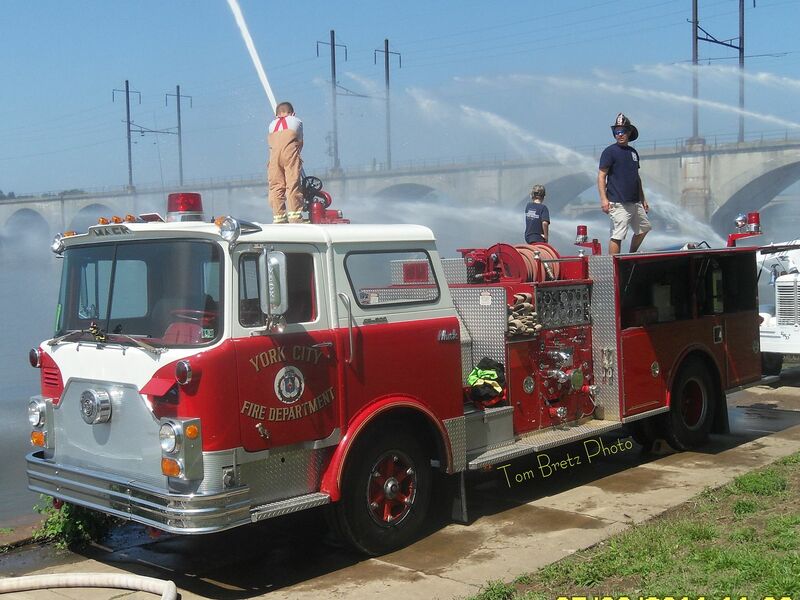 The same picture is in the History of the York City Fire Department book. I just realized the other day that it has been 5 months since we put the old girl in storage. Soon time to go down for a visit. In the mean time I purchased two things for her. A smoke ejector and an apollo monitor with a base which will be mounted to the cab roof. Also, this year I need to get the coolant changed, fix the windshield wipers, and wrap the corners of the jump seat area with diamond plate to cover up the rust (until it can be properly fixed). Also would like to get some hand tools purchased and mounted. Lots to do!